The Avengers: Age of Ultron directed by Joss Whedon and starring Robert Downey Jr and Chris Evans continues the story of the Marvel comic group of hero’s, as they continue their fight to save the earth from the threat of darkness. The films opens with an action packed scene as the Avengers battle a group of terrorists in Europe. New enemies are introduced as the Avengers search for Loki’s stolen scepter, which has a powerful stone inside it. They race to get the scepter back into the right hands. Once they retrieve the scepter Tony Stark and Bruce Banner waste no time with trying to create something that can help keep the peace and the scepter protected. Tony uses his engineering talents to create a form of artificial intelligence with the hopes of it being the answer to all their problems, but as soon as the AI begins to take it’s form, the stages of evolution begin to take place and the entity that was designed to help turns into something much more sinister, and out of that Ulton is born. In the process Tony has the program set where Jarvis has control over the entity, but Jarvis is quickly overpowered and Ultron destroys Jarvis. The team bands together to battle the constantly evolving Ultron. He does everything in his power to break the bond and trust the Avengers share including using two powerful mutants Quicksilver and Scarlet Witch, (which were created by William Stryker, the same man that created Wolverine) against them. The group retreats when they are overpowered and they seek refuge at Hawkeye’s home with his wife and children as they begin to regroup. Captain America comes up with a battle plan, and each one the Avengers uses their strengths to battle Ultron. Ultron is thirsty for more power as he creates a group of autobots, to help destroy the Avengers. In the meantime Ulton possesses one of Tony Stark’s scientists and forces her make him a more sustainable body. In the process he becomes more powerful. Eventually Scarlet Witch and Quick Silver realize that Ultron plans to destroy all the humans on the planet and take over the world with his new artificial intelligent colleagues. They go against his plan and join forces with the Avengers to help save the people of earth. Stark comes up with a plan to recreate a manifestation of Jarvis using the stone from Loki’s scepter. The manifestation of Jarvis has now altered into Vison. A powerful being that has a multitude of abilities. The will of the Avengers is strong as they all join forces to defeat Ultron. 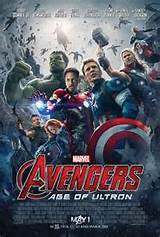 Overall The Avengers: Age of Ulton was an awesome movie. The story was well written and gave each of the characters an opportunity to shine in an appropriate manner. Sometimes when movies have an all-star cast, the story can get lost in the process and the actors get swallowed whole, but this is not the case with the Avengers sequel. They each had good on screen chemistry and the new characters added to the adventure. The special effects were remarkable and captivating. The battle scenes took you to another realm and made you feel like you were in the adventure. Now we know that there is a bigger story behind the Avengers and that all the Marvel Superhero movies are connected. In the end we see Thanos make another appearance saying “I will just have to do it my myself.” As he reaches for a glove with five holes in it. I don’t know too much about the bigger story, but I do know that the Infinity stone that was in Loki’s scepter is connected to the infinity stone in the Guardians of Galaxy. More stones will appear throughout the Marvel Superhero film world, which will lead to the Infinity Wars in the distant future.